Eldergleam Sanctuary is an underground grove and worship site of the followers of Kynareth. 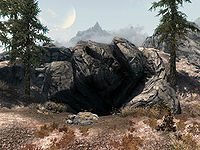 It is located directly north of Darkwater Crossing, among the sulphurous pools and hot springs of Eastmarch. 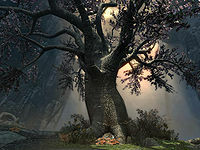 Eldergleam Sanctuary is renowned for its remarkable beauty and a giant tree named Eldergleam, which is said to move its roots for one weapon only. The naturally-lit cave also abounds with plants and insects that can be harvested for alchemical ingredients. Sond and Asta can be found worshipping inside. A copy of the Restoration skill book Mystery of Talara, v 2 is leaning on the rock next to Asta's knapsack. There is a chest protected by Eldergleam's roots in the very back, along the western wall. Hit the roots with Nettlebane to access the chest, which contains a random-level weapon or piece of armor, and also some other loot. Just prior to encountering Asta, you will find a chest and a corundum ore vein atop the rocks near to the northern wall, next to a tree. If you want the corundum, do this before going up to Eldergleam, as Maurice will permanently occupy the vein once his part is complete. You can also paralyze him to break his focus long enough to mine the vein. This might be a bug. A second corundum ore vein is located outside, west of the entrance. Go past the mammoth skeleton and look for it on the other side of the nearby geyser. This page was last modified on 18 October 2017, at 11:43.